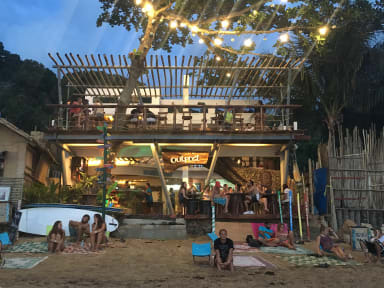 Best hostel in The Philippines! The Staff is awesome.. Have lots of booze in The bar with Teddy, Dennis, Yuki, Zack, Paul and all The Rest of de the Crew. Go on a boat tour with Olli and his Wicked setlist and secret spots.. We did it Twice :) Outpost has The perfect location, great atmosphere and service. 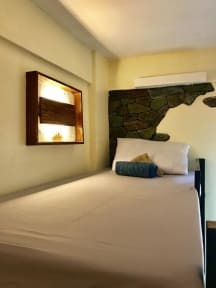 It's The place to stay in El Nido! I Will definitely Go Back! Esse é O HOSTEL de El Nido. Pé na areia, vista maravilhosa (sol se põe na frente do hostel), inacreditável. Clima ótimo para conhecer novas pessoas, todas as noites rolam festas no hostel (apenas até às 22h depois todos vão para as baladas e bares de El Nido). PROS: Food, People, Facilities, NICE VIEW, staff. CONS: Location is 50 pesos or 25 min walk away from city center, beer is expensive (More then in the side deck bar (Republica bar), 12 people dorm always with the door open.